This English TV version begins with a retelling of the Baskerville legend describing the curse on the Basskervilles that seems to have just brought on the death of Sir Charles Baskerville. Sir Henry Naskerville is coming in from Canada to claim his inheritance. "As you value your life or your reason keep away from the moor" is the message he gets upon arrival. Sir Henry has inherited over 1 million pounds. Besides the Hound, there is also a dangerous escaped criminal loose on the moors. There was a seance scene where Sir Charles talked through a lady, pretty scary. Then the creature came to the window. Next the escaped convict comes in to the house. Watson then discovers that Holmes has been on the scene, spying undercover. Watson is not happy to have been tricked. When Sir Henry turns up dead, Holmes blames himself but then they discover it isn't Sir Henry, but the convict in Sir Henry's clothes. Holmes then surmises that Jack Stapleton (Richard E. Grant of Withnail fame) is really a Baskerville from his resemblance to a picture of an ancestor on the wall. The Hound then attacks Sir Henry, and Holmes and Watson kill it after it has badly mauled Sir Henry. Lestrade arrives and arrests Jack Stapleton, who is really John Baskerville, who was Sir Charles illegitimate son, and next in line to the Baskervill fortune. 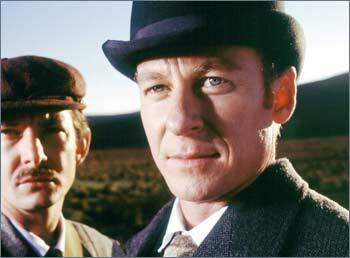 I thought Ian Hart played a good, smart Watson, but Richard Roxburgh was not a good Holmes. Overall, a decent movie, even though it was not too fateful to the Doyle story. Richard E. Grant made a good villain and seeing Watson as a stronger character than Holmes was also interesting.